One more from the collection. 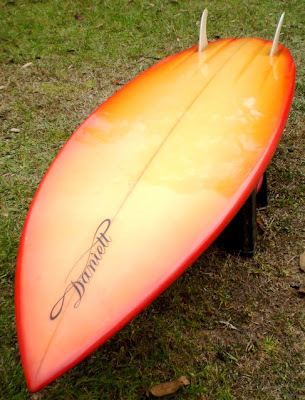 A very clean condition Peter Daniell's shaped 6'0" diamond tail, channel bottom twin fin from 1982. 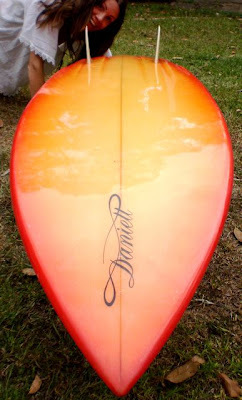 Daniell's is one of Australia's most experienced and productive shapers who is still pumping out cutting edge shapes today. This board is so nice even I'm stuck for words. A glorious wide tail set up with lots of lift and speed, 2 relatively small fins that make it nice and loose but a little skatey. What a lovely simple spray. This board is just such a neat package. Australian... or South African shaper?? Peter is Australian. Started shaping/making boards when he was 16. Is now 59 and still shaping. His boards and shop are called Division. Could be mistaken with Peter Daniels, the South African shaper... My dad owned a thruster shaped by him in the early 80s. I learned to surf on it. 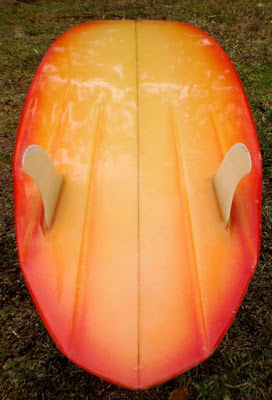 I've got a sweet swallow tail, single flyer twin daniell... i ride it all the time... so loose for an oldy and handles i reckon up to 6 - 8 ft. it's got a massive Johnson & Johnson logo glassed on... weird huh. must've been a competition board or something.